This will make you want to grab your hand sanitizer, STAT. In an online survey conducted by a team at Mulberrys Garment Care, about 1,000 respondents revealed some of their grossest laundry habits. Most appallingly, the study reports that 18 percent of men and 10.5 percent of women say they don’t wash their underwear… ever. Yuck! Eighteen to 24-year-olds are the most hygienic undergarment cleaners, the Mulberry’s team reports. Most (around 85 percent) said they toss their underwear in the laundry after one or two wears. Only 10.3 percent said they never wash them, the lowest percentage of any demographic. On the other hand, 16 percent of middle-aged people reported never washing their underwear, the highest of all age groups. Feeling grossed out? We’re just getting started. Bedding is another unclean culprit, the survey found. (By the way, here’s why you should be washing your pillows WAY more often.) 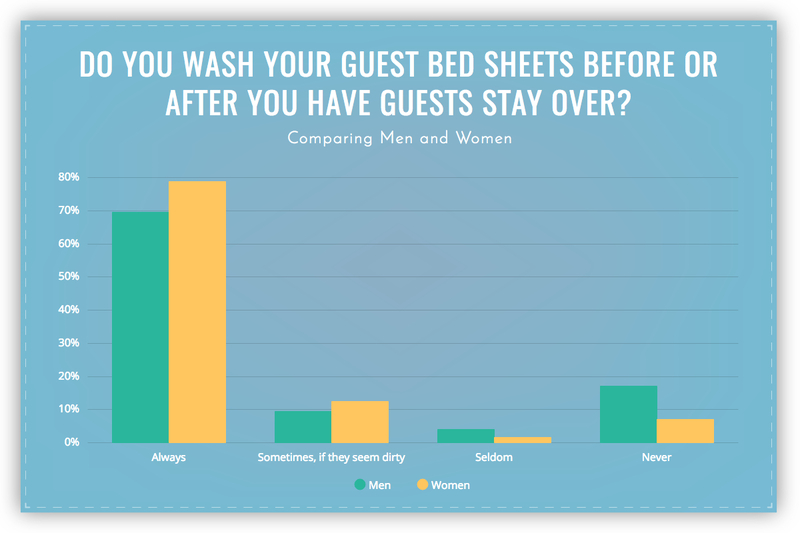 Seventeen percent of men and seven percent of women report that they do not wash their guest bed sheets before or after having a guest over. We’ll be sleeping on top of the comforter from now on. There also appears to be an gender gap when it comes to laundry habits; women tended to be more reliable about washing their own bedding. Seven percent of men reported washing their bedding only once in the last six months, as compared to just three percent of women. Forty-three percent of women said they wash it every week, while only 31.6 percent of men did. In fact, 12 percent of men say they can’t even recall the last time they washed their bedding. Granted, laundry can be confusing—even for the careful germophobe. To make sure your own stuff is tip-top shape, check out this definitive guide to how often you should clean everything.